I’ve been wanting a new capo for awhile now–one that can be placed and moved easily with one hand, but isn’t a big mechanical contraption hanging off my guitar neck. That pretty much ruled out all the “trigger style” capos on the market. 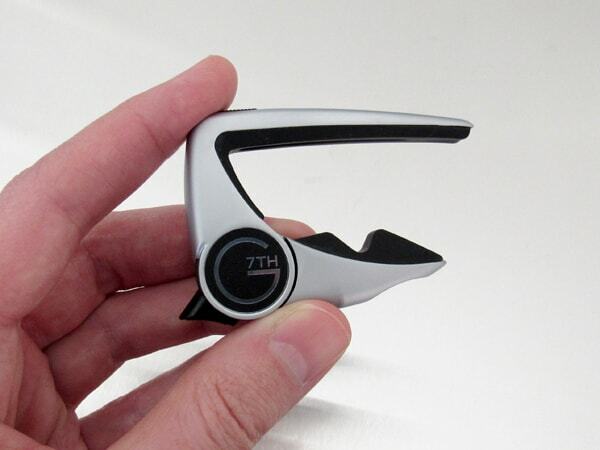 This is why I was intrigued with the G7th Performance 2 capo. It seemed like the best of both worlds: easy one-handed operation, but without bulky triggers and handles hanging off the back of my guitar’s neck. But would it live up to my expectations? First, a few photos of the packaging. 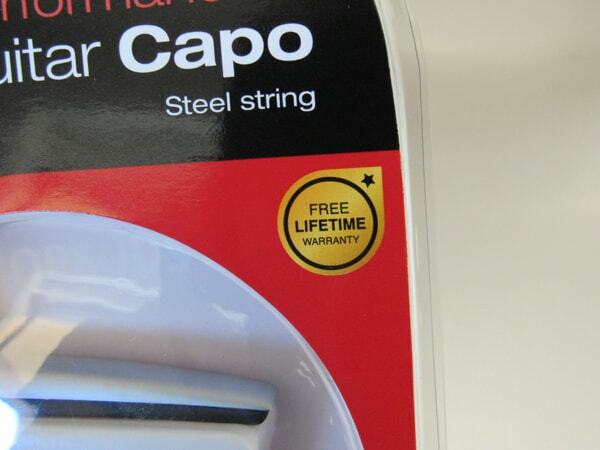 Check out photo #3 over there–this capo features a LIFETIME WARRANTY. When the G7th Performance 2 arrived, I was immediately surprised to discover it was smaller and lighter than I’d always imagined. Oh sure, I’d seen plenty of photos of this capo and even seen it in use in videos, but for some reason I was expecting it to be much bigger and heavier. Instead, it was surprisingly light and compact. There really aren’t any other capos out there that use a clamp/release mechanism similar to the G7th. In this regard, the G7th Performance 2 capo really is in a category all its own. 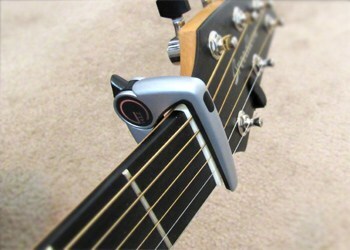 The closest competing design I could find was the Thalia 200 Series capos (pictured here). 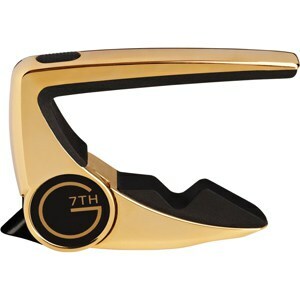 However, it isn’t really a good comparison because not only is the Thalia capo a fundamentally different design, it’s also 2-3 times more expensive than the G7th Performance 2. 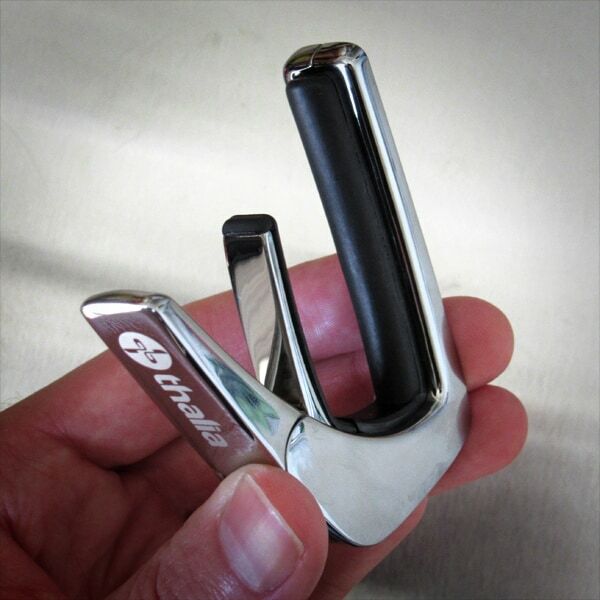 If you’re interested, you can read my Thalia capo review here. Oh, and there’s is also a G7th Performance 2 for Classical guitars for all you Classical and Flamenco players out there. 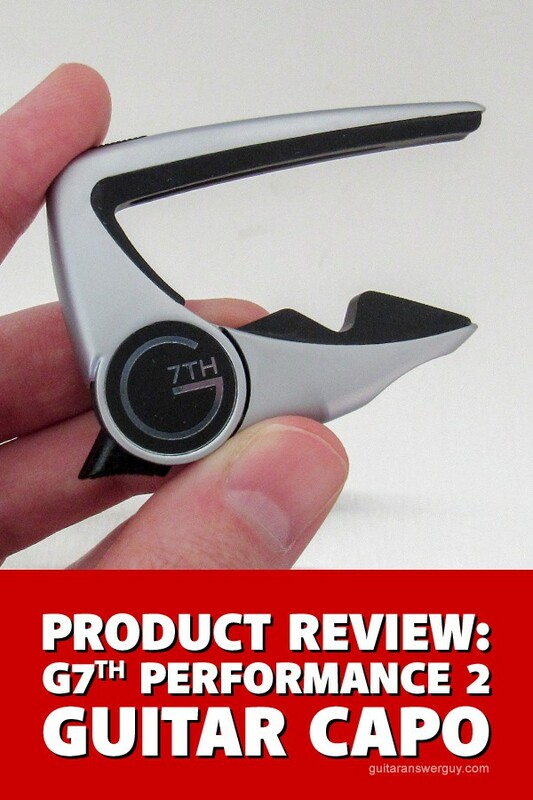 As the opportunity comes up, I’ll try the G7th capo on more guitars (including electrics) and update this review accordingly, which includes changing the ratings, if necessary. 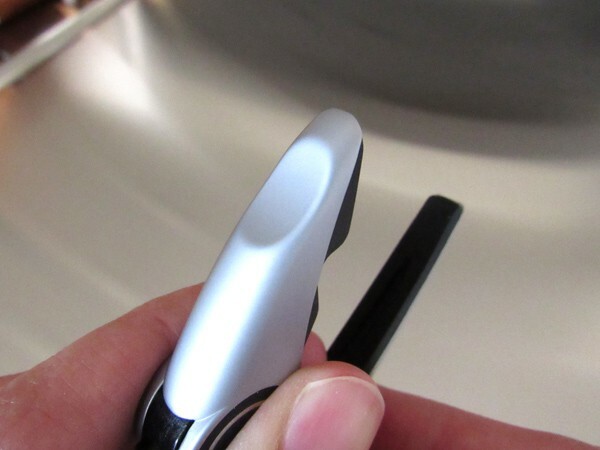 Tip: Since you can control the amount of clamp pressure, it’s possible to store the capo on the headstock if you’d like. If you gently clamp it just slightly behind and on top of the nut, as I have here, it’ll stay put without affecting your tuning or muting your strings. Be sure to remove it if you put your guitar in the case. 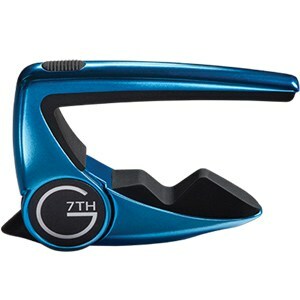 The G7th Performance 2 did exactly what a capo’s supposed to do. 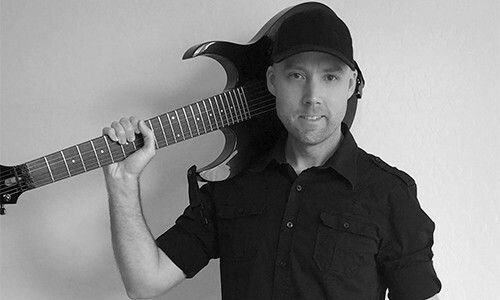 On my Breedlove acoustic, which has a 16″ fretboard radius and 10-50 gauge (ultra light) strings, it was easy to clamp and then relocate with one hand–just as advertised. The only reason I deducted half a star here is because on the Fender Kingman acoustic, which has a 12″ fretboard radius and 13-56 gauge (medium) strings, I needed to really squeeze the capo hard or use 2 hands to create enough clamp pressure to eliminate all buzzes. However, it still did the job. Another thing I liked is that the G7th Performance 2 didn’t make my notes sharp once it was clamped in place. This is a potential problem with any capo, but wasn’t an issue with the G7th. Pretty awesome. The G7th Performance 2 is a breeze to use: Just put it on the fret of your choice and give it a firm squeeze to clamp it down. 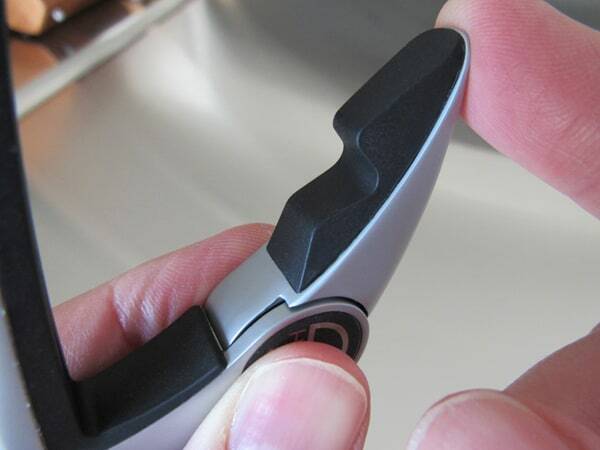 You can choose to clamp it from above or below–whichever works best for you. 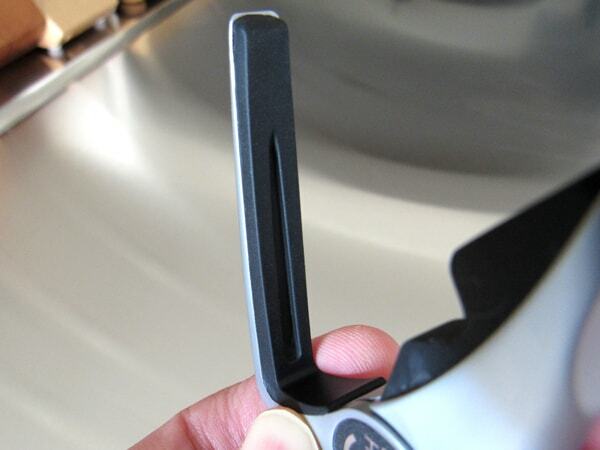 If you need to release or move it, simply squeeze the little black release lever and it immediately releases the clamping mechanism. Move it, reclamp, and play on. Deducted half a star here for the previously-mentioned need to sometimes squeeze it with 2 hands on guitars with heavier strings. Let me be clear here: I do NOT think the G7th Performance 2 is overpriced. 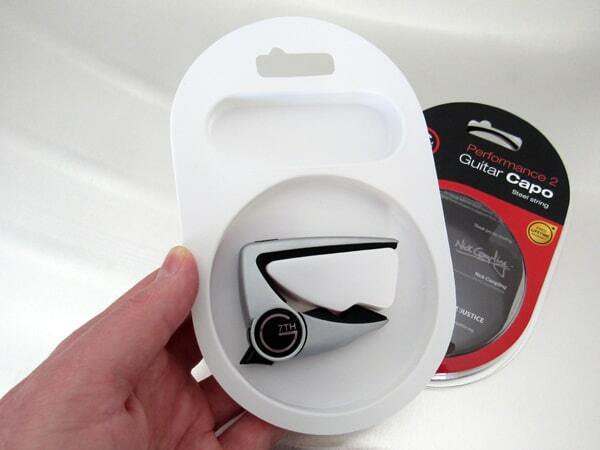 I only deducted 1.5 stars because it’s in the mid-high price range for capos–which some of you may not like. My personal opinion is that the price of the standard models (black or silver) is a great value for what you get. Now, if you choose one of the fancy colors or limited edition versions, you’ll pay more, and that’s totally up to you. Clamping the G7th Performance 2 in place with one hand is really fast and easy. Unclamping and removing or relocating with one hand is just as fast and easy. I deducted half a star because trigger-style capos still have a slight edge here. However, the speed difference is so small that it’s almost negligible, especially considering how compact and unobtrusive the G7th Performance 2 is compared to trigger style capos. Also consider this: the G7th doesn’t squeeze notes sharp, so the nanosecond longer it might take to relocate it is made up for by the fact that you don’t have to retune your guitar–as you might with a trigger-style capo. 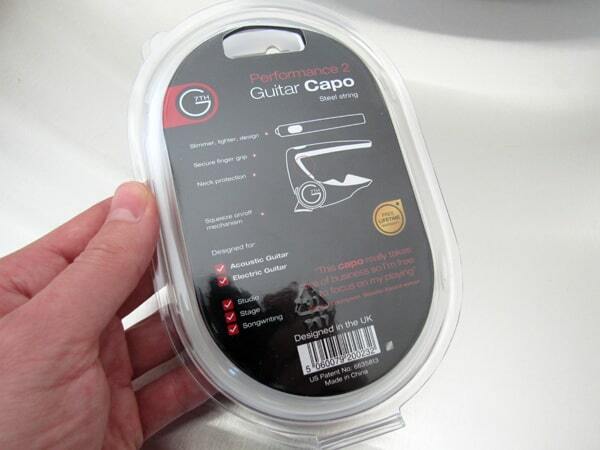 I can’t see any reason that this capo would damage a guitar. The rubber pads that contact the back of the neck, though pointy, are soft enough that they won’t damage the finish on the back of your guitar’s neck in any way. Of course, it goes without saying that you should never leave any capo clamped on your guitar when you’re done playing for the day. 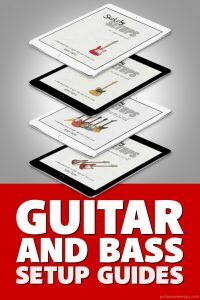 With really heavy strings, you may need to squeeze extra hard or even use 2 hands to create the right amount of clamp pressure. 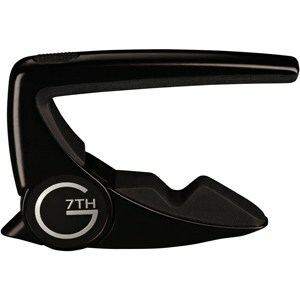 The G7th Performance 2 is a great capo, and I really really like it. 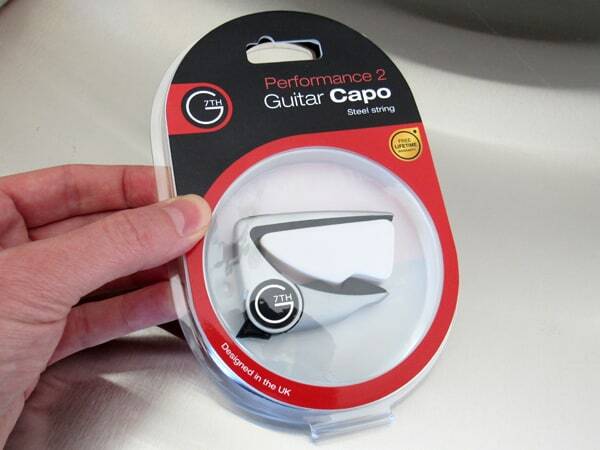 Though it’s a higher-priced capo, the value is definitely there… especially when you factor-in the lifetime warranty. Why That ONE Guitar String Just Won’t Intonate Is the Future of Guitar… Minimalist?